Innovation is a regular theme at SuprTEK’s ADEV program. Creating leading edge technology web applications that interface with military enterprise systems to provide command and control personnel with the latest mission and resource information is a difficult challenge. The program relies heavily on innovation and a “can do” attitude. To recognize the leaders of this innovative spirit, SuprTEK’s ADEV Senior Program Manager, Dan Shaffer, and Solution Engineering & Delivery Vice President, Ron Howard, created the Tesla Innovation Award. The award is named for Nikola Tesla, an inventor credited with creating or advancing many of the technologies that make modern life possible including Alternating Current electricity that powers the world. A small group of SuprTEK ADEV technical leaders, at Dan and Ron’s behest, put their heads together and decided that naming the innovation award after Tesla would be appropriate. Brandon Sanders, a “gap year” intern at ADEV, is the first to receive the Tesla Innovation Award. Brandon played a leadership role in creating a tool for the Services Validation Project that enabled the team to both emulate web services to aid in development and evaluate the response and data provided by web services. In developing two suites of web applications that rely heavily on external web services to operate and perform as intended, this innovative tool is an invaluable asset to the success of the ADEV Program. “We already have a number of innovators we want to recognize at ADEV, and we hope that the innovations continue as the program proceeds. So, we anticipate that this will be the first of many Tesla Innovation Awards, but we wanted to recognize Brandon before he left to pursue his academic career,” Dan Shaffer explains. Brandon took a year off after high school during which he interned at ADEV. He will soon complete his internship and begin his freshman year at Worcester Polytechnic Institute (WPI). The ADEV team hopes to see Brandon return for more intern work during his college breaks. Ron Howard served as the major impetus for the award because he believes it is important to recognize team members’ contributions. 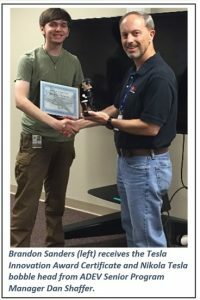 “We have a lot of really great people on this team,” says Ron, “and I want team members to know their work is appreciated.” Tesla Innovation Award winners receive a framed certificate of appreciation, a Nikola Tesla bobble head, and a gift certificate. Don Reed is a Senior Technical Writer with the ADEV program. His background includes engineering and programing, project management, quality and business improvement, and business-technical communication.